As I was archiving old posts I’ve made for guest spots and now defunct publications, I came across a post that I was rather fond of. With permission from my old editor, I wanted to share a live reaction piece I wrote back when the second season of Owarimonogatari aired roughly this time last year. When I originally wrote these impressions, there was almost no tweets, screenshots, or impressions from anyone online. I might have been one of the first to write an article about these as they were airing (and they were staggered out throughout the day, too) so I was eager to get to my thoughts for what might be one of my favorite series of all time. I don’t think I’ll ever be able to express how much this series means to me- writing about it was my introduction to anime writing in the first place. Where some people saw a meme factory or just something to be lewd over, I really rallied behind the writing in the right places. Vertical recently finished the US releases of the Monogatari: Second Season novels and I had to purchase Hanamonogatari since that particular story means the world to me (I have every intention of writing about it, too!). Maybe it isn’t your cup of joe but there’s no harm or foul in sharing my impressions I wrote last year. As part of a deal between Aniplex and Crunchyroll, on 12 Aug 17, the second half of the newest addition to the Monogatari franchise became available for streaming exclusively on the anime service’s platform. Covering the time span between the entrance exams and graduation for protagonist Koyomi Araragi, the pieces on the board begin their final moves as the balance of the material world and the supernatural one swing full force in a quiet rural town. Ecstatic to be granted the opportunity to cover the anime epic’s latest chapter, I chronicled my impressions for the respective arcs below. It is understood that this deep into the series, the interested parties are those already reading/watching the series and are familiar with the lore, but I will still try my best to make these impressions as accessible regardless. There is a classic leg of any journey in storytelling- the protagonist must face their personal/inner hells before returning to the path that will take them to their objectives. It is only fitting in a tale of oddities and the sort that the main character actually has to face these hurdles in hell. Araragi has been sliced to bits by the leader of oddity specialists Izuko Gaen and awakes to find himself in hell with Hachikuji Mayoi, the child whose spirit was wandering his hometown and recently passed on. As with anything related to Mayoi’s character, I have to get it out of the way that I loathe both her character and the noise that usually accompanies her in the stories. Personally, I find it to highlight everything wrong with the franchise, but I am understanding that some folk hail it as their favorite aspect to it. To each their own, but we’ll go ahead and gloss over all of it that happens in this arc. I found this arc particularly interesting because it offered a brief pause in the story progressing for Araragi to question his resolve. It feels so cliche to just say, but it has to be noted because for the most part of the series he serves as a passenger in others’ crossings with the supernatural. It is an interesting blend of something akin to A Wonderful Life and a heavy status check within a world vibrant with characters and moving pieces. As he progresses through to reach a return to the material world, Araragi is posed with the question: “What if I was never involved with (character)?” Several times throughout the series, he has spoken against how indifferent to life and relationships he was, but as he evaluates how everyone probably would have been fine without him, or that they would eventually reach solutions to their issues without his meddling, he comes to the same answer: it doesn’t matter. The answers he seeks in the twisting world of the occult means nowhere near as much to him as his love for living. It isn’t found in a bold “I have to get out of here, I’m sorry for everything I’ve done, I promise I’ll be good!” kind of revelation, but rather a slow boil “I never realized I’ve been going the complete opposite way of my own way of thinking from the start.” one that strengthens his resolve for adventures to come. Arguably the most important detail about this arc (besides a last minute reveal of a force at work) is Araragi’s awakening to the true central theme of the series: balance. Everything that happens in Monogatari is due to a character’s actions taken to achieve their own view of balance. For Izuko, her birthright Gaen clan, and known associates, this has led to several disturbances in Araragi’s life (most notably an attempt to place a goddess in an old abandoned shrine overlooking his hometown). On one hand, this paints characters like Gaen and the con-artist Kaiki Deishu as traditional “antagonists” since they both inconvenience the protagonist and his friends. On the other hand, that makes people like Meme Oshino, who seeked his own way of balancing things during Kizumonogatari just as antagonistic for what they did to Araragi and the vampire now known as Shinobu throughout Monogatari. This, however, is muddied by actions taken by the very same individuals at later points-namely Kaiki seeking balance for an action by Gaen and, very late in this arc, Gaen herself seeming to “undo” an action that pulled Araragi out of hell. The normal way of putting it would be these characters are “anti-heroes”, however the way everyone seeks their own view of balance doesn’t hit good or evil entirely. It fits the author’s motif perfectly to have double negatives portray the multi-faceted nature of human morality. Technically speaking, this arc has the beautiful Shaft visuals going in rare form. What could have easily been a bleak and chilling view into the afterlife is instead exploded with abstract art and the signature music that makes the series so wonderful. A callback to the ending theme visuals of the series, a good part of the journey is drawn in the super abstract way people really enjoyed- with the characters being a mix of construction paper and black colored with uber slim designs. Naturally, things like the evolution of the belief people had in the name of park felt significant thanks to the flamboyant visual aids that gave a lot of context to the discussion. While I personally found this arc plagued with a lot of the issues the series faces, the highs were very high up and it left the audience with the teaser taste of the final climax for the main story-line. My excitement almost boils over as the protagonist finally realizes his own values and what he needs to harness to see things through. My, what a pleasant surprise. A fan favorite moment of the series amongst most people I’ve spoken with bar none is the episode at the end of Bakemonogatari where Araragi and Senjougahara go on their first official “date” together. In this arc, the two of them make up for “six months worth of dates” and go on a magnificent little trip together. As the rare romantic elements blossom with visuals at their peak, there is a calm that comes over the atmosphere that really shouldn’t given the events prior. 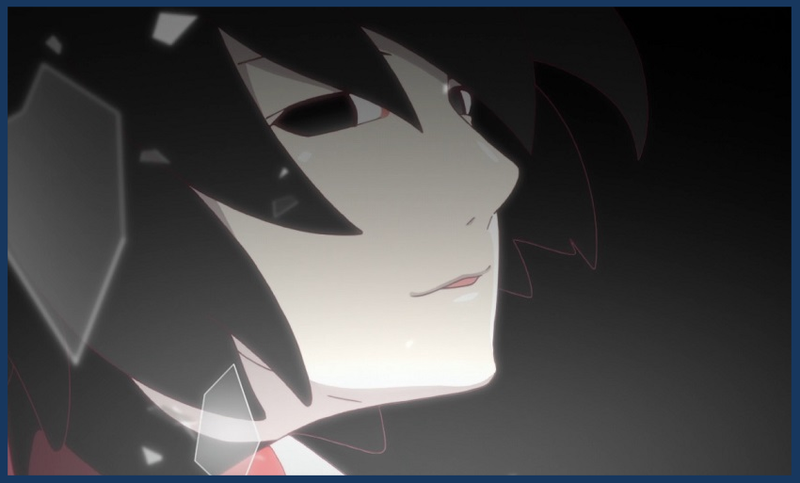 In the middle of his road trip, there is a dream-esque encounter Araragi has with the mysterious Ougi Oshino that makes a fascinating lore build using a planetarium. Anyone who knows how wild Shaft can make everyday locations lights up with joy at the prospect of them animating a planetarium, and the results do not disappoint. Characters stand on planets, stars fly by, and laser pointers are used for impressive transitions between dialogue. The discussion is sweating foreshadowing from its pores, and like the dream it was meant to be for Araragi, it is over in a flash. Somehow, the deep dive into the universe and darkness in its various corners don’t stick out uncomfortably in the middle of a short arc dedicated to a heartwarming date. If nothing else, it makes the beauty of such lighthearted moments all the more beautiful. While it is the exact same length as the last arc, the speed of things (especially after the aforementioned Ougi dream) feels a lot slower and cozy. The couple discusses details over Gaen’s requests in the coming days and the future to come. There is enough to make anyone cautious of a tragic ending, but the peace feels too intoxicating to resist. The ending theme is delightful (when isn’t it), and the after credits scene hypes up the last of the three arcs perfectly. Truthfully, there isn’t much else to the story that is worth diving into without spoiling the biggest moments of the date, but it is far from an oddball out. In fact, sticking this smack dab between the two serious arcs is just the right move. This is exactly what eight years of slowly, masterfully building your franchise should feel like in a finale. I always advocated that you get what you put into this series, and the return on investment did not feel cheated at all if not just for how glorious this arc was. Right out of the gate it should be said the great opening and ending songs might not make the Mt. Rushmore of Monogatari legendary songs, but they were firing off of all cylinders with this one. The music felt right in the wheelhouse for delivering heights of mood and matching the bright colors with equally bold feeling in delivery. It is very likely the conversations and drama of this series would fall flat without the score constantly breathing life into what would otherwise be a pretty show. The visuals aren’t to be sold short, either, as the muted colors used throughout this arc are right on par with anything else Shaft has done for the franchise. I found myself enjoying the controlled, dark lit scenes a lot more now than in the past- a credit to the evolution of the franchise. The story itself is nothing short of a masterpiece. If the audience lets it, this series can really burrow into the brain and pull out a multitude of philosophies, feelings, and debate. When the arc builds up to the peak of the roller coaster, it is hard to argue it doesn’t set these kind of mind exercises up better than ever before. Observations aim for the jugular, series long reflections and ideologies are challenged, and emotion pours out of the scenes. The usual rap the writing gets for being double negative word fodder isn’t present like it sometimes is in other instances (which make for an incredibly difficult defense of the franchise, I’ll admit) and the back and forth characters have pay immediate results. Surprisingly enough, this is one of the first arcs of the series to feature almost every significant character in the franchise. Typically near half of the cast goes without being so much as mentioned if the event has nothing to do with them, but even for a brief second, the main pieces on the board are referenced at the very least or have lines. There are a ton of unexpected dialogues had between characters that actually electrify the atmosphere of the arc as the behemoth sixty five minute story reaches its climax. Honestly, I had no idea what the last twenty minutes was going to be like as soon as the final confrontation began. I say that in the sense that even for Monogatari, the audience can pick up on the vibe of the direction a story might be going before miracles happen. A series hailed for its deep thought found me simply riding along with the emotion of the scene until the conclusion in such a beautiful nature. This is clearly not going to be the end of the series- it is far too successful and there is far too much source material left to reach into the well for. What cannot be argued, however, is that the main conflict for the series is finished and that the focus, Koyomi Araragi’s wild year after encountering a vampire, has finished its’ recollection. Massive stories to be told, such as Shinobu’s origin story, or even smaller ones akin to Hanamonogatari are still on the schedule for years to come, but it is critical to not let that diminish the payoff this arc brings the overall Monogatari experience. All of the great elements mixed in with the uncomfortable and disappointing ones feel so worth it in an end that only feels fitting for a young man who defies the balance of the world with a muddied sense of altruism. Monogatari is not for everyone- I feel like I start with that almost any time I discuss the series. It doubles down on elements that forsake anime from a good chunk of viewers, and it demands not only a massive amount of time to experience, but 100% of the viewer’s focus to get anything out of. To call it an abstract art might sound like a stretch, but for what it does so well, that only feels right. The visuals are constantly pushing the envelope and the music rivals any anime out there. Even the most minor characters are fleshed out and have their own characteristics and ideologies that separate them from a traditional story. “Storytelling” is my go to plus for this franchise with good reason-this is one of the best told stories I’ve experienced. There are no easy explanations and everything reaches conclusions with brilliant thought. I explained the story to one of my writing mentors one time and they were floored by the detail it goes to, but immediately off put by the art and wild antics. Such is the Monogatari experience- all of the highs and lows of a medium.